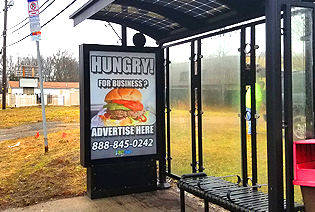 Bus shelter panels offer showcases for advertising, mounted usually two per shelter in glass, backlit frames. They provide 24 hour visibility to vehicular and pedestrian traffic at high-circulation locations. Bus bench advertising consists of 4-color process silk-screened posters affixed to the backrest area of bus benches. Located at bus stops within urban areas often at high traffic intersections. Trash Bin advertising consists of 4-color process silk-screened posters affixed to the front, back and sides of oura solar trash bin. Displays are affixed to permanent trash bin structures.